When planning for retirement, many investors are concerned about potential erosion of their savings over time from taxes and inflation. As a result, they may focus more on strategies that will help maximize their savings for the long term. Longevity is a growing risk as individuals are living longer. According to the National Center for Health Statistics, 49% of today’s 65-year-olds are projected to live to age 85, 28% to age 90, and 11% to age 95. Currently inflation may be low, but over time, savings can lose purchasing power. Health-care costs have outpaced inflation and average earnings over the past 15 years, the Kaiser Foundation reports. Once retired, savers face new challenges around managing money in retirement including deciding which accounts to draw on based on when those assets may be needed. Some retirees may find it useful to segregate their nest egg into different “buckets” based on when they will need the funds to meet income needs. There are many different versions of this strategy. One approach is a three-bucket strategy that involves separating assets by purpose and accessibility. For example, in order to meet current income needs and to prepare against having to sell off appreciated assets to have enough money to cover expenses or emergency events, savers can create a short-term bucket. These funds could be invested in liquid accounts that are easily accessed, such as certificates of deposit or money market accounts for times when cash is needed in the short term, e.g., living expenses. The short-term bucket may include funds to cover bills for up to two years. 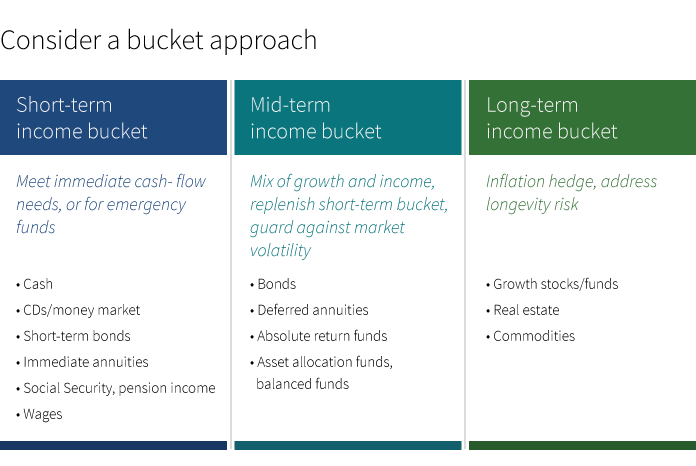 The goal of a mid-term income bucket would be to save money with the potential to grow income and incorporate strategies that may help guard against negative impacts from market volatility. This could include a mix of growth and income investments in bonds or balanced funds, with a goal of maintaining these holdings for three to 10 years. The long-term income bucket may serve as a hedge against inflation, which could help savers keep up with inflation and protect against the risk of outliving their assets. This group of investments has a time horizon of 10 years or more. Types of investments may include equities, real estate, or commodities. As with any retirement income plan or strategy, it is important to seek professional advice to help craft a saving and withdrawal strategy that fits an individual’s financial situation.